What is life like for a child who has a parent in prison? Photographic portraits of 30 children whose parents are incarcerated, along with their thoughts and reflections, in their own words. 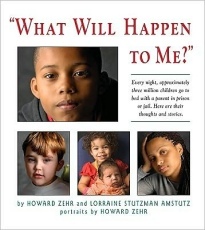 Reflections of several grandparents who are unexpectedly parenting children whose parents are incarcerated. "Ten Questions Often Asked by Children." "Dealing with Emotions" - - including grief and loss, shame and stigma, anger and isolation. Resources for "Staying in Touch," "Finding Moments of Celebration," "Adjusting to a Parent's Return," "Self-Care for Family Caregivers," and "Suggestions for Third-Party Caregivers." "The Children's Bill of Rights." along with thoughtful consideration about how to apply restorative justice and respect for relationships in these difficult situations.